Back in the old internet days, people rarely changed email addresses. Today is a different story with people changing jobs and having multiple email addresses. Sometimes email programs don’t want to let go of the old addresses and keep displaying them for us, which can present problems. This happened to a friend of mine who mistakenly sent an email to a colleague’s old work email address. I’ll skip the embarrassing parts and show you how to delete an email address from Gmail. Part of the problem arises because Google, like many email programs, notes who you’ve sent email. If you type in an address in the To: box, Gmail stores that info in your Google Contacts. 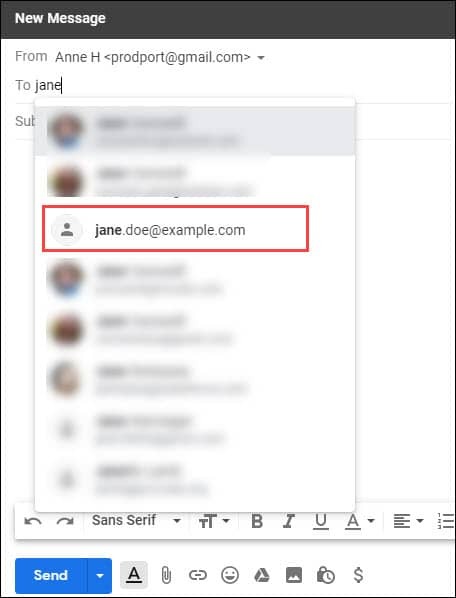 In the example below, Google will automatically add a record for jane.does@example.com to my Contacts once I click the Send button. If you were to open Google Contacts , you would see Jane’s new record that has the email address and my test email. A similar process happens if I hit Reply to an email and send it. Google assumes that I correspond with the sender and automatically adds to my Contacts. 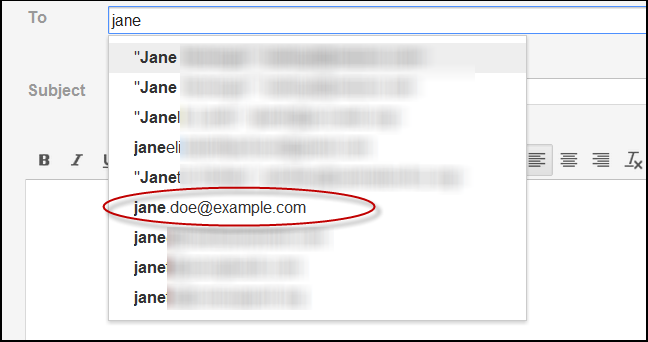 To make it easier, Google also shows these email addresses and names when you start typing in the To: box of an email. They call this feature “auto-complete” and the matching emails and names are displayed by the frequency of use. Using the test example above of Jane Doe, you can see Google has added her name to the suggestion list. This is also where people can run into problems because they may have selected the wrong email or misspelled it. Start typing either your contact’s name or email address in the Search bar at the top. Click the 3 vertical dots on the right side to see More Options. Now, when you compose and email message and start typing in the To: field, your changes should be reflected. You will not see any entry for Jane Doe in auto-complete. Deleting the Google contact will not remove any correspondence. You should still your emails. Some folks may prefer not to have this Gmail feature. Instead, they prefer to add contacts. Click the Gear icon in the top right. This will open your Settings page. While Google is smart in many ways, sometimes you need to offer a helping hand and edit your Google Contact records or settings. Otherwise, you could find yourself sending correspondence to old email addresses that may no longer be attended.